Today was fun! We had a professional actor on our campus (we'll call him DH) who did a special presentation for our GATE kids, a dramatic performance of Edgar Allen Poe. The teacher who organized this event asked if I minded meeting with DH before his performance to go over some general procedures and such with him, introducing him to the audience, and staying for the performance to watch over (and ultimately dismiss) the students. Of course I agreed; not only did this get me out of part of third and all of fourth period, but I've always enjoyed Poe's poetry. It wound up being an awesome performance. DH's rendition of The Tell-Tale Heart was so intense that my arms were breaking out into goosebumps. At one point, I thought the actor was going to break the wooden chair he was using as a stage prop, and you could hear all of the students draw in their breath. After the performance, I escorted DH to the staff cafeteria for lunch and introduced him to several different teachers. Six of us sat together and had a pleasant time chatting over some good, hometown cooking (aka: cafeteria food). Gratitude never takes anything for granted. I'm sure it was ASB students who put the vase on my desk. 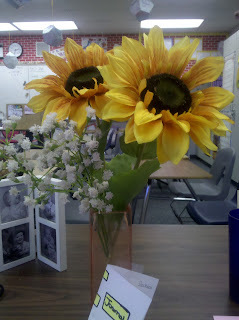 A few students I didn't recognize were in my classroom last week, asking me random questions such as "What's your favorite flower?" and "What's your favorite color?" This week is staff appreciation week, so I think they're doing something special for the teachers. Still, I loved the personal nature of the little gift (the journal, the sunflowers)...it was a really sweet gesture. Arghhh...between the last paragraph and this one, Elijah threw up all over the place. Clint and I just finished cleaning everything up and getting him settled back into bed. Not sure what's going to happen now for tomorrow. I really don't want to stay home from work, but Clint is getting docked pay now for his absences. I love Poe! I also think it was awesome for the ASB students to leave you a gift of gratitude with such a nice note. I hope your little one is feeling better. I love Poe's poetry too, Kristyn. It has this dark, edgy quality that has always attracted me (but without being overtly dark). And I know it's cliche, but I just love love LOVE the Raven. The way that damn bird mocks the poor man's misery is brilliant.